Spectrum is an action maze game where you play as a blob with three eyes. 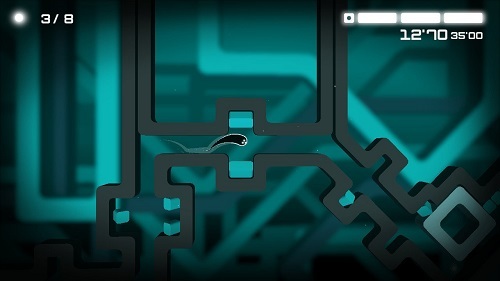 You must ‘swim’ through the air and avoid certain colored blocks as you make your way to the exit portal. It’s available to download on nearly all current game consoles, but reviewed on PS4 here. Control is very easy. Press one button to jump and another to dash downward. You can jump and dash infinitely, so it’s like you’re ‘swimming’ through the air, if that makes any sense. You can touch white blocks, but if you touch a lightly colored block, you’ll lose one unit of energy, represented by one of your ‘eyes’ on your blob (three in total). If you lose all of your eyes, you’ll have to start the level over again. Be careful not to touch any dark colored blocks as they will destroy you instantly. Collect glowing white orbs to replenish one of your energy units. Sometimes you must grab a black orb to open a path, too. When you reach a portal at the end of a stage, you complete the level. Beat a level under a certain time, collect all the white orbs, and I’m not sure what the last objective is but if you do all of them you’ll earn a trophy for that level, signifying you’ve completed it perfectly. Overall, the game reminds me of a PSOne title called Irritating Stick, where you had to make a stick travel through a maze without touching the sides (it was also based on a Japanese game show). Spectrum’s an all right game, but it does have a few problems. It could use a few more modes. A two to four player split screen race mode would be perfect, and I’m sure the game could handle it. Also, while the difficulty ramps up nicely and gets pretty hard halfway through, there are only four main worlds and four minus worlds (with ten small levels each), so content is a bit on the short side, too. If you lose all your energy or touch a dangerous block, your blob will explode, but that’s about as violent as it gets. Reading skill is helpful for some of the text, but not necessary just to play. Younger gamers may get frustrated at the later, more difficult levels. Spectrum is rated E for Everyone.